City-Bay. It is an iconic SA event that literally stops a city… closing Anzac Highway is kind of a big deal! Many of the runners I run with regularly (and I’m talking about people who regularly compete in road races) don’t like City-Bay because it’s just too big – it’s too hard to get through the crowd. It is an event that many new runners (myself included, when I first got started) aspire to. It’s got something for everyone – 3km, 6km and the Main Event (and by far the most popular), the 12km. There are walkers, joggers, runners, pram pushers, superheroes, and of course the crazy fast elite runners. I wrote in an earlier blog post about my journey to my first City-Bay, starting in high school in 1991 or 1992, and culminating in my debut in 2013. This year was my third consecutive City-Bay. My previous efforts were 57:32 in 2013 (I wanted to get under 60 minutes, mainly so I could get to my soccer game in time!) and 55:57 in 2014 (also followed by a soccer game, although that year I did at least get to chill at the finish line at Glenelg for a short while before making my way to the game). I didn’t really enjoy my run in 2014. Maybe I put too much pressure on myself to get a PB. The first one was great because I just soaked up the atmosphere, it was a novelty, having never been in such a big event before. As a result, I hadn’t intended to run City-Bay this year. I did run the inaugural Bay-City in April and really enjoyed that – the much lower crowd numbers made it a lot easier to move! It wasn’t until after I started to find my speed after the Barossa Marathon in May that I started seriously considering running City-Bay again. 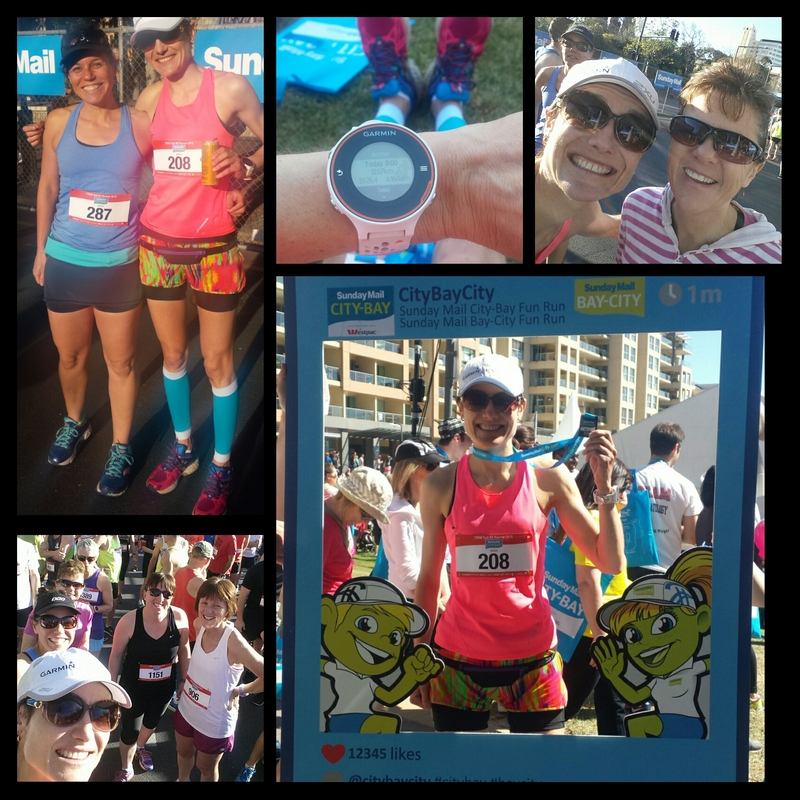 It wasn’t until Saturday that I had my race outfit sorted – the top I really wanted to wear was the one I had worn for City2Surf but I couldn’t find it anywhere! I went for really bright colours and pretty much ALL of them! My race eve preparation consisted on wine tasting in the Adelaide Hills. Highly recommended! This was followed by a pre-race dinner of roasted vegies and rice, courtesy of friend Kieron, and the cider that seems to be a common feature of the pre-race meal! On race morning I was up early, at 5:15, and left home at 5:45. All my gear was ready (I was tossing up between blue and purple Compressport calf sleeves, but couldn’t find the purple ones so that made for an easy decision!) I had, a few days earlier, had the genius idea (I probably wasn’t the first person to have this idea) to put my cereal and milk into my Nutribullet the night before and make it into a smoothie that I could drink in the car on the way there. I made a slight error in judgement the first time I tried this, putting chia seeds into the mix which of course thickened overnight and consequently the next day I needed a spoon to eat it! This time I threw the chia seeds in just as I was about to drink it. It looked incredibly unappetising but actually tasted pretty good! I managed to get a park quite close to the tram stop (and away from the road closures so I could make a reasonably quick getaway) and onto the first tram of the day. I wanted to get into the city in plenty of time for a toilet stop (or 2), and a decent warm-up before getting into the sub-60 starters ‘cage’ well before the 8am start. By the time I got into town at around 6:50 it was a little less chilly and after my warmup of about 2.5km along the Torrens, I had well and truly defrosted and the sun was out. Warmup and toilet stops completed, I was in the cage well before 7:30. The time went quickly because I very soon spotted regular running buddy Beck, and after that, everywhere I turned there was someone I knew! Before we knew it the countdown was on, 8am struck and we were off! In the beginning I was running with a lot of familiar faces – John, Matt, Matt, Tom, and Graham. Most of those are regular parkrunners so people I run with very regularly! The day before at parkrun, Graham had told me he was aiming for 54 minutes. I was aiming for 54 myself – that would have been a PB by around 2 minutes, and a nice round number of 4:30 minutes per km. So I decided to try to stay with Graham for as long as I could. I had set the pace alert on my watch for 4:00-4:30. That meant that if I ran faster than 4 minutes per km (yeah, right!) or slower than 4:30, my watch would vibrate to let me know. 4:30 was the average pace I needed for my 54 minute goal so as long as I stayed under that pace for the most part, I would get my goal time. As those who have run City-Bay would know, the start can be a little congested. So it is important, if you are running for a time, to get a clear run. Hence the advantage of the sub-60 cage – chances are you wouldn’t see too many people walking in this group (elite walkers aside, who were of no concern as they’d be WELL ahead of me!) and so it would be easier to get a good solid start. I didn’t really have a strategy in mind (other than staying under 4:30 pace). The first little bit of City-Bay is uphill (not steep but just slightly uphill) and then it’s all a very slight downhill gradient from there. I was happy to get through the first kilometre in 4:21 – well inside my goal pace. Very early on (just on the edge of the city) I almost lost an earring! Miraculously I managed to catch it and re-install it without having to stop! After that, things went pretty smoothly until around 7km. 7-8km is the point where I have previously hit the ‘wall’ in City-Bay (if such a thing exists in a 12k!). My mouth was getting a bit dry (possible dehydration from all the wine the previous day, plus it was pretty warm out there) so I decided for the first and only time in the race to get a drink. I managed to grab a cup on the run, have a sip and ditch the cup without breaking stride (my attempt to slam dunk the cup into the bin, however, was an epic fail). I don’t think it was the drink stop that did it but I definitely felt my pace slow, if only by a little bit. I was averaging 4:15 pace up until about 7km. I didn’t have the brain power to do the calculations but even so I could tell that a PB was almost a certainty, and I should be able to do sub-54 very comfortably, barring disaster in the last 5km. Despite slowing a little in kms 7-11 (I averaged about 4:20 for those 4km – still well inside my goal pace) my overall average pace only dropped to 4:16. I knew my time was going to be well beyond my expectations. In the process I had managed to break my 10km PB by nearly 2 minutes (set at City2Surf last month, no doubt much of that was running downhill!) Even if I ran 5 minute kms for the last 2 km, I was still going to run well under 54 minutes. It was nice to be able to chill at Glenelg for a few hours post race, and I was pleasantly surprised when I found out the SARRC BBQ had vegetarian sausages – thanks Leanne! It was great to catch up with so many running buddies from my various groups, most had had good runs, but unfortunately a few had not – I know what that’s like! It was a perfect day to relax in the sunshine – it was a bit warm out on the course for a lot of people but I must admit I didn’t notice the heat – much like at Gold Coast. So that’s City-Bay done and dusted for another year, and another piece of bling for my ever growing collection! Thanks to race director Joe Stevens and his team of fantastic volunteers for putting on another great event – I plan to be back again next year and I might even push for a sub-50 – who knew? Previous PostPrevious Running is mostly mental… or maybe that’s just me!